Jimmy Cricket has been talking about his love of live theatre – and how a new European Union regulation could affect it. The famous entertainer has been discussing the issue in his latest monthly newspaper column in the Lancashire Evening Post. “Live theatre takes us on to another level and here in the UK we’ve got the world’s best. After all, this is the home of Shakespeare. 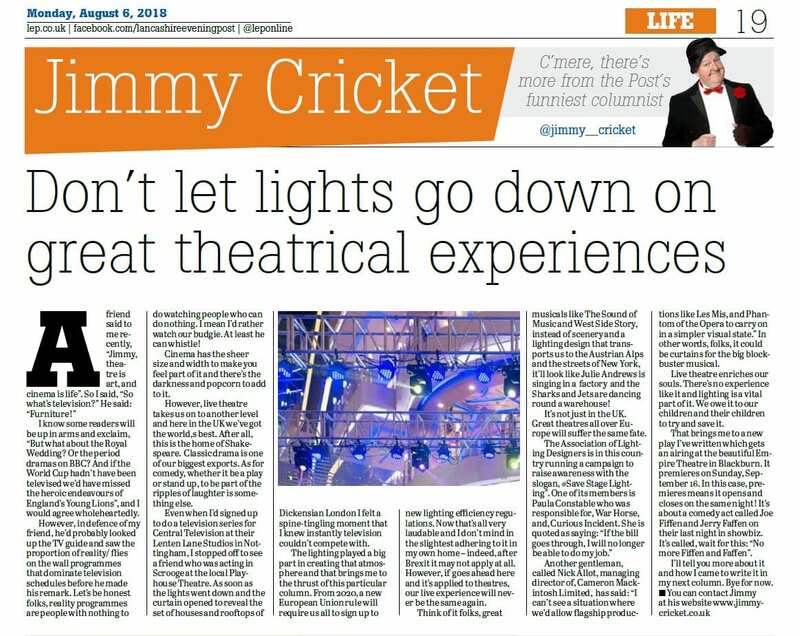 Jimmy, 72, says the lighting plays a big part in creating the great atmosphere in theatres. However, he points out that from 2020, a new EU ruling will require everyone to sign up to new lighting efficiency regulations. “Now that’s all very laudable and I don’t mind in the slightest adhering to it in my own home – indeed, after Brexit it may not apply at all,” says the Rochdale-born comedian.